Ponds support an incredible diversity of animal life. Some, like the microscopic protozoa and tiny water fleas, freshwater shrimps, fish and snails, spend their whole lives in the water. Others, including of course frogs, toads and newts, numerous bugs and beetles and the spectacular dragonflies, come to ponds to breed and are dependent on water for the early part of their lives. Even a few moths have caterpillars which live under water. As well as these which depend on ponds, many birds, mammals, insects and the grass snake come to find food and water.  All these creatures, together with the plants, make up an interdependent community which has had millions of years to adapt to ponds. Here are just a few samples from the great variety of pond animals. 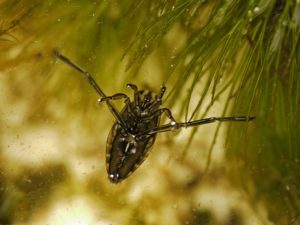 Water fleas up to 1.5mm long, swim freely in the water and are very common. They have a transparent shell covering thorax and abdomen through which the heart can be seen beating. Most species feed on minute plant life, and form a very important source of food for many predators. Freshwater shrimps are an important source of food and are often found in shallow water among plants and under stones where they feed on decomposing animals and plants. Pond skaters skim across the surface feeding on insects which have fallen into the water. They are some of the first colonisers of new ponds. Backswimmers are often seen swimming upside down as they hunt just below the water surface, propelling themselves along with their powerful back legs. Their piercing mouthparts can inflict a painful bite. See drawing on right (courtesy of English Nature). Whirligig beetles are the small beetles frequently seen swimming in rapid circles on the surface of ponds. Their eyes are in two parts so that they can see both above and below the surface. Diving beetles are carnivorous and swim swiftly through the water hunting for food. They have strong wings and can fly from pond to pond, usually at night. Most can live for several years and lay eggs every year, which develop into larvae which are voracious predators. The larvae inject poison into their prey which partially dissolves the internal organs. Dragonflies and damselflies are brilliantly coloured and incredibly skilful fliers. They are one of the oldest orders of life, their ancestors having been around 300 million years ago, long before the dinosaurs emerged. 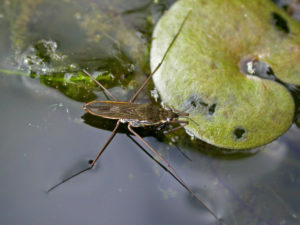 Eggs are laid among pond plants where they develop into nymphs which live under water hunting for small insects and tadpoles. After one or two years the nymphs crawl out of the water, split their skin and emerge as adults. Moorhens frequently nest on even the smallest of ponds, building a nest amongst marginal vegetation. Fold-out charts published by the Field Studies Council www.field-studies-council.org, include Reptiles and Amphibians of Britain and Ireland, The Freshwater Name Trail, Commoner Water Plants, Dragonflies and Damselflies of Britain, and are on sale at HART meetings.